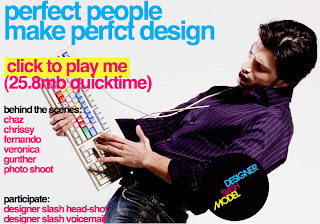 This is a brilliant tongue in cheek website, photoshoot, video and push about the design world and it’s people. It’s interactive, well made and makes you laugh. Put together by the creative folks at Digital Kitchen who also just won an Emmy for their fabulous design work on the hit tele show Dexter. So Double kudos to them. What else can I say except, thanks for keeping my eyes entertained. Go to the site, watch the video (totally, like, worth it) and have a play around. Thanks to Alan Ainsley at the Leith Agency for this.